Coffee is Uganda’s leading foreign exchange earner generating millions of dollars every year. 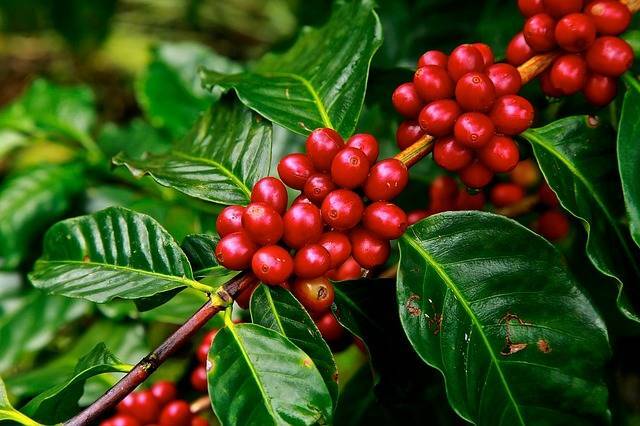 The plant is mainly grown for its berries which are grinded to give a caffeine beverage liked by most of us. The plant is locally known as “Emwanyi” and is mainly grown on the slopes of mountain Elgon, and in the central region. The soils must be well drained fertile soils with a high organic content. When you add mulch to the soil you will not only maintain the moisture but you will also enrich the soil's organic content. The famous coffee berry tree is best started using cuttings though even seeds can be used. As a Uganda Coffee farmer you need to do proper field preparation because coffee production is going to be a long term investment. Mark position where you are to put your coffee plants using pegs arranged in regular patterns to facilitate management. Dig circular holes of 60 cm (2ft) in depth; this should be done at least 3 months before planting. Obtain coffee seedlings for planting from reliable commercial nursery beds, make sure that the seedlings are disease free, not wilted or have no form of deformity. Planting coffee seedlings should be at the onset of rains. Put a small shade around each young plant to protect it from drought stress or scotching sunshine. Also ring mulch to keep the soil around the plant moist. Be sure to have a spraying routine against insect pests and disease. With an average of 1000 coffee trees of say Robusta coffee in an acre you can harvest about 8,000 kg in a year. Harvest coffee beans when their color changes from green to ripen red. This is important because when you mix in unripe beans, on drying they will spoil the quality of the beans. Contacts us here to buy quality Coffee Beans and Coffee Seedlings in Uganda. Coffee is an imported crop in international trade. The coffee you grow can be sold to traders or coffee exporting companies; however you should be conscious of brokers who go an extra mile to buy the crop before even the trees bear berries. Prepare the land meant for planting to remove barriers. Open up holes (10x10) ft spacing for Robusta coffee and (8x8) ft for Arabica coffee. Remove the polythene sleeve from the root ball. Carefully loosen caked soils around the roots to ease water uptake and root development. Place the plant in the hole with the collar at the level with the surrounding soil. Water seedlings before and immediately after planting. Shade the seedling using stakes to protect it from the sun shine. Have a weeding, spraying, and fertilizing routine.